Exeter City missed a chance to move into the League Two play-off places as they conceded an injury-time equaliser in their away match at Oxford United. Danny Hylton put the U's ahead with a 10-yard volley, but Arron Davies's powerful strike made it 1-1. Exeter thought they had won it when Alex Nicholls scored with a close-range looping header in the 87th minute. But James Roberts rescued a point for United when he curled a left-footed shot which went in off the post. Match ends, Oxford United 2, Exeter City 2. Second Half ends, Oxford United 2, Exeter City 2. Goal! 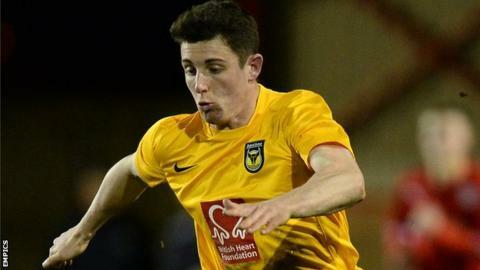 Oxford United 2, Exeter City 2. James Roberts (Oxford United) left footed shot from outside the box to the bottom left corner. Assisted by Danny Hylton. Hand ball by Josh Ashby (Oxford United). Substitution, Oxford United. Wes Burns replaces Josh Ruffels. Goal! Oxford United 1, Exeter City 2. Alex Nicholls (Exeter City) header from the centre of the box to the centre of the goal following a corner. Corner, Exeter City. Conceded by Ryan Clarke. Attempt saved. Tom Nichols (Exeter City) right footed shot from the right side of the six yard box is saved in the bottom right corner. Corner, Oxford United. Conceded by Matt Oakley. Substitution, Exeter City. Danny Butterfield replaces David Noble because of an injury. Danny Hylton (Oxford United) wins a free kick on the left wing. Foul by Jonathan Meades (Oxford United). Attempt missed. Josh Ruffels (Oxford United) left footed shot from the left side of the box is close, but misses to the left. Corner, Oxford United. Conceded by Craig Woodman. Substitution, Oxford United. James Roberts replaces Callum O'Dowda. Attempt missed. Danny Rose (Oxford United) right footed shot from outside the box is close, but misses to the right. Corner, Oxford United. Conceded by Jordan Moore-Taylor. Attempt missed. Tom Nichols (Exeter City) right footed shot from outside the box misses to the right. Corner, Exeter City. Conceded by Jake Wright. Attempt missed. Christian Ribeiro (Exeter City) left footed shot from the left side of the box is just a bit too high. Corner, Exeter City. Conceded by Josh Ruffels. Attempt missed. Tom Nichols (Exeter City) right footed shot from outside the box is too high. Second Half begins Oxford United 1, Exeter City 1. First Half ends, Oxford United 1, Exeter City 1. Corner, Oxford United. Conceded by Arron Davies. David Noble (Exeter City) is shown the yellow card.